When did Web 2.0 become synonomous with Sharing? And I mean "Sharing" with a capital "S". Sharing knowledge, lessons learned, product reviews, tips and tricks, links/bookmarks, and even photos makes sense to me. The ability to harness collective intelligence (the whole wisdom of crowds thing) is something we all benefit from. But that's "sharing" with a small "s". I believe the "small s" version is what Tim O'Reilly is referring to in his Web 2.0 Compact Definition . He doesn't even use the word "sharing". He uses "architecture of participation." And participation is not the same as Sharing. But the definitions of Web 2.0 have morphed and made Sharing=Goodness a central theme. And sometimes, Sharing means Too Much Information. More and more, the Web 2.0 and Blog world feels like a highly-scaleable, web-enabled way to peek into more medicine cabinets. And it's even sucking the slightly elicit fun out of that now that we're all encouraged to Share. Where's the mystery? Where's the excitement that comes from not knowing everything? Is the (metaphorical) allure of the strip-tease gone forever? I don't want to know what's in my present before I open it. I look away during movie trailers. I love the air-tight secrecy around Apple's product announcements. 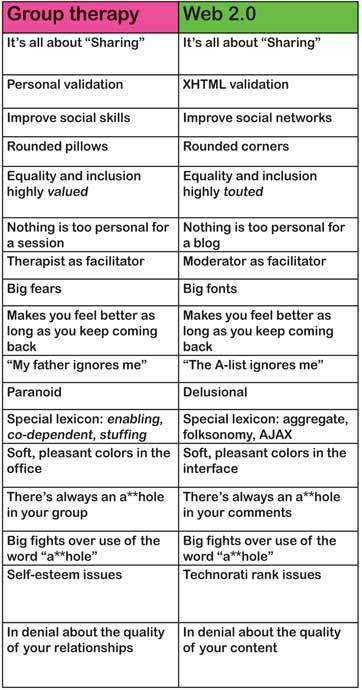 Please, please Web 2.0 folks -- don't let "harnessing collective intelligence" become group therapy. Feeding our lust for personal, public revelations (it's just a matter of time before nearly everyone has been trashed online by an angry ex) isn't helping raise our collective intelligence. Happy with myself I clicked on NO link. @ Ed: but just think, they could use all those stock images of clocks. The advent of Web 2.0 occurred around the same time the internet was neutered by some unseen hand. Kathy, When are you gonna start talking (audio blogging)? I'd love to have you speak on my blog (http://vlog.oraflame.com)as a visiting evagelist. about how some aspects of web 2.0 may not be always the best for all. It is a paradox, that something that theoretically contributes to share things places, and help us discovered undiscovered places on the web, ends up creating an elite where all of us do the same things and go to the same websites. Have you noticed? Example: how many people check the second results page when looking for something in delicious? Does it mean the content in the follwing pages is that bad as to be ignored? But we click because everyone else did. Haha, I didn't click on any of the links! Here at Concordia University, we engineers take a course that basically teaches us to chase less after the celebrity gossips, read more news more carefully, and ignore graphical political advertisements. Good stuff -- when can we have our next appointment? Kathy, I wonder if you are subtly referring to the (group validation) pile-on in the Rogers Cadenhead's vs Dave Winer 'case'. My feeling is if you're true to yourself, you won't need therapy - group or otherwise. Thanks for the business idea... Long time fan, first time commenter. I actaully got funding for your idea!! !